My second figure sculpting class was just completed. The students at first learned hollow building techniques and made upright figures, which are listed toward the end of this slideshow. They expanded the techniques further in the latter two-thirds of the class, by making whatever they wanted. That is why you see varieties of styles here. I think each piece demonstrates its creator's unique artistry. I shall proudly present their sculptures to you in this blog. This slideshow gives you a quick tour of my side of the joint exhibit called "Life Dimensions / Life Lines." It looks simple, but the curator and I spent 2 days laying out this show. Our efforts paid off. Correct heights of the pedestals, spaciousness around each piece, and lighting seem to have transformed my work. 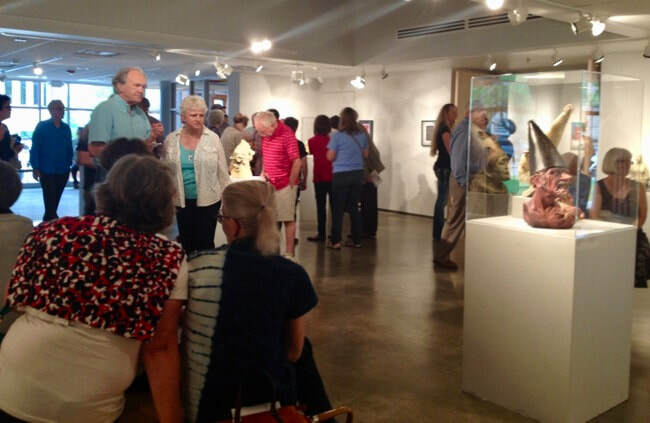 You will be able to see this show at the Dahl Arts Center until August 18. I was thrilled to see that the gallery was packed with people at the opening reception of my joint exhibit with Darrel Nelson last night. This show was my first steppingstone. I will have to clear numerous more before reaching my goal as an artist, but I felt as if the direction I should go had been revealed to me. Thank you, my friends, for your support. It has not been easy for me to learn to photograph sculptures. There aren't many tutorials online. This post shows you how I made my living room into a photography studio with very little expenses. Hope this will give emerging sculptors a glimpse of how it could be done. My impression of my last trip to Japan can be expressed in two words,"very full." My family and friends often prepared rich foods in order to welcome my return, and I also prepared rich local dishes for my hosts. Food was like a token of love in the country, where people do not verbally express it. My stomach and heart had gotten very VERY full. These are my students' pieces. Thank you, Iva, Dottie, BJ, and Asia, for your enthusiasm. It was a pure delight to share not only creativity, but also laughter and good food in this class. I plan to teach another class like this at Dahl Arts Center next Fall. It will be advertised on EVENTS page of this website and also on Facebook. Please look forward to it. I've been adding eco-friendly features to my house little by little. This year, I made a laundry pulley over my washer. It not only saves space, but also humidifies the air. As warm air rises, the laundry seems to dry quicker. It is working better than I thought it would be. I'm with a big smile! Most of my home renovation projects have been completed. I am excited to return to sculpting. Perfect Home for Sculpture "I Care"
Artworks sometimes manage to find right homes. The sculpture "I Care" certainly did. 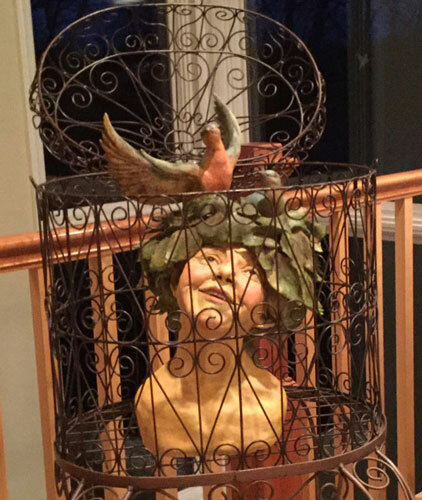 A couple, bird watchers whose house is located in a bird sanctuary, came to the last American Craft Council show with the intention to find a piece to put in a decorative bird cage (photo). With the lid open, the whole thing signifies more meaning now. "Martha and Co," the wife calls it, is releasing the birds into freedom. I was delighted that a couple, who knew about Martha the last passenger pigeon, acquired this piece. I feel like a mother, whose grown child has just left the nest. Despite my initial worry, I feel reassured that the child will do well in the new home. Sorry for the dark image, but my booth was well lit. 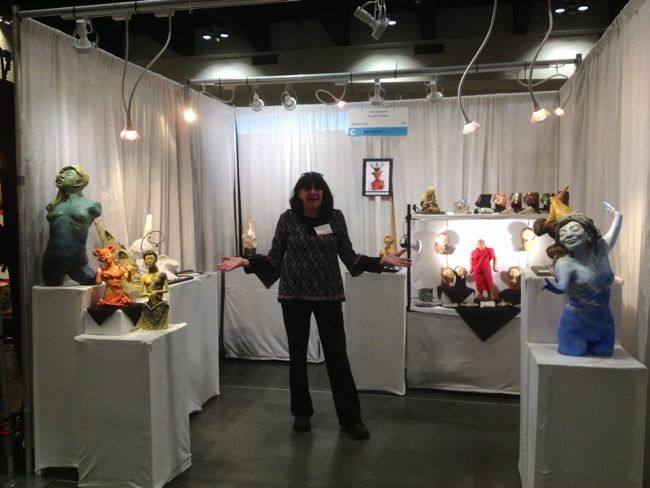 My first American Craft Council Show was utterly exhausting. By the time the show was over, I was speaking in Japanese to an American. My brain seemed to have stopped functioning after being exposed to too many stimuli. It has been a week since the show, and I reflected on the experience. What was the most rewarding to me was the fact that my works managed to provoke profound emotions in people of all ages. For example, when a woman saw SOAR (on the front right of the photo), tears welled up in her eyes. She had never seen a thalidomide survivor portrayed with confidence and hope. An artist, who had liked my works and had asked me intriguing questions, returned to my booth two days later with his wife and a daughter. I want to reach people's heart with my art. That is my ultimate goal. Business part of the show should not be in the way of my creativity. Deep-breathe, close my eyes, and open the eyes of my heart. People will notice art that has come from the heart. With this lesson in my mind, I will compose new works. ​Thank you all for your support. 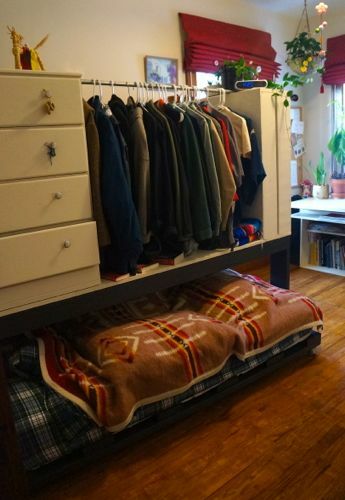 Making a trundle bed and a closet-and-storage space above it (photo) was a minor project. However, making this 86-year-old house more energy-efficient has been a challenge. So far, the walls, ceiling, and roof deck have been insulated. The windows have low-E coatings and insulated curtains. All the cracks have been filled with Big Stretch caulk. As it has been taking so much of my time, I asked myself how important my principal was and felt like giving it up. As this year's project has been completed, I now feel good about it. After taking a rest, I will probably regain the energy to tackle a new project, which will be to insulate the crawl space and hot water pipes. For now, I'm glad to be back on ceramic works.